Traditional Swahili script has developed an unmistakable ductus (shape) of its own. It is usually marked by a well-rounded f, q, and w. It has neither the reduced scribbly shapes of modern Arabic writing, nor the oblique angularity of Persian. 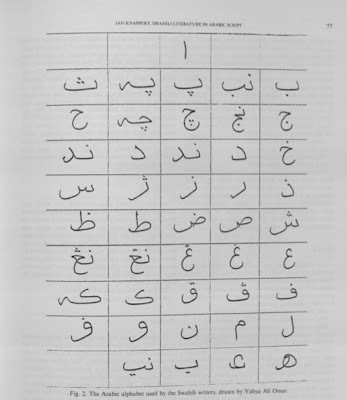 It resembles most the old-fashioned Indian and Malay forms of Arabic script, and is quite distinct from Urdu writing, except that during the last half century some attempts have been made to introduce Urdu conventions for aspiratives and retroflex phonemes which curiously fit the Swahili phonemic system. This will be discussed further below. 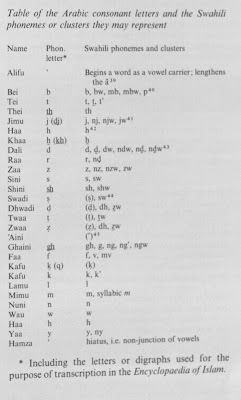 One thing sets Swahili writing apart quite conspicuously from all other forms of Arabic script: the vowels have to be marked. There are about half a dozen different conventions for writing Swahili as it developed over the centuries showing how they have struggled for the perfection of their writing system. 3. The 19th century: the introduction of ch and p.
b. The representation of homorganic nasals. c. The representation of g, ng, and v.
d. The representation of alveolars. e. The representation of aspirates. From the first period only one text survives, the Hamziya., which I have described in an article in African Language Studies (see note 23). In the middle of the 17th century the Swahili language was still in an older period of its evolution and so was as different from modern Swahili as 16th-century Portuguese is from the modern language. We may therefore omit a discussion of its orthography, since no continuous tradition can be traced from that time to the present, except in the metre of the poem. It is the 18th-century epic that stands clearly at the inception of the continuous tradition of Swahili poetry. The spelling in these epics suggests that those MSS were used only as aide-memoires for the reciters; they were not intended for solitary reading and enjoyment. The principle of the orthography could be called ‘herufian’, i.e. syllabic, in the sense that every herufi, i.e. consonant-character, represents a syllable, never more nor less, so that every line has exactly eight herufis. It is possible that the system was invented by Mwengo bin Asumani himself in the great MS that is now in Hamburg, and which I have always suspected was written by his own hand, since it seems to be contemporary and is completely consistent, in spelling, orthography, dialect and other aspects of presentation. His system works well provided the reader knows the language and the writer makes no mistakes in spelling or in prosody. 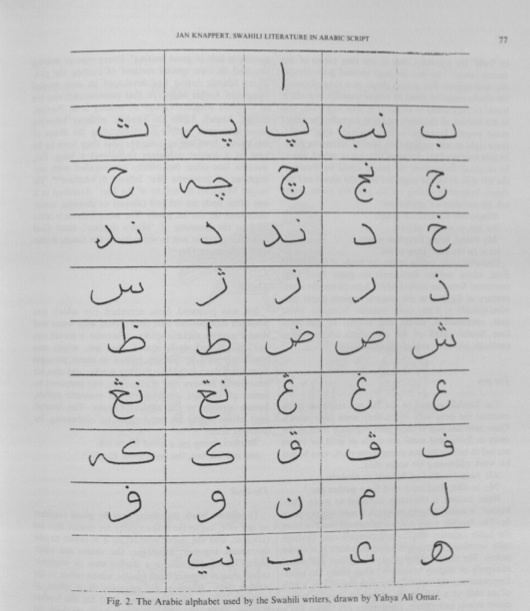 The basic principle is the syllabic system of the Swahili morphophonemic structure, on which the grid of the Semitic consonant system is superimposed. The result is that a number of letters are given more than one phonetic value. There are only three vowels in Arabic which serve for the five Swahili vowels. F has to represent f and v, d has to represent both dental and alveolar d, as well as nd, i.e. d with preceding homorganic nasal. B represents b, mb, p and aspirated p, as well as bw and mbw. 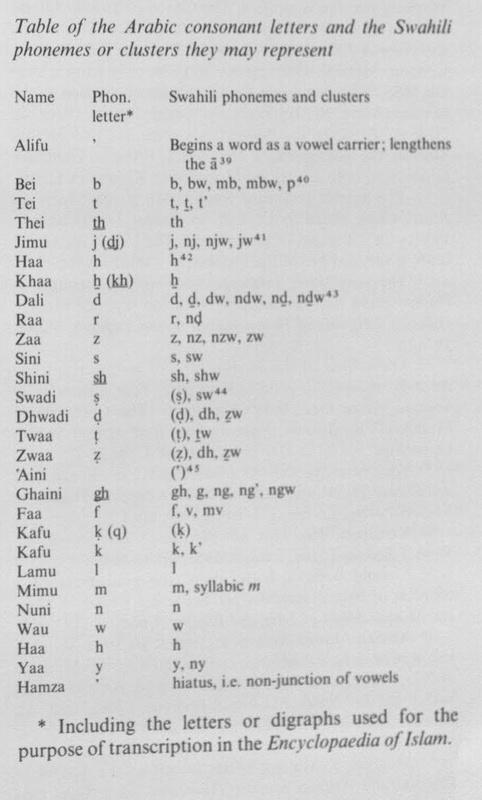 Ghain represents gh in Arabid words, and in Swahili words g, ng, and ngw. K represents k and aspirated k’ as well as kw. M and n can represent labialized mw and nw, but unsyllabic prenasalisation is not shown. Y reads as y or ny or yw. T represents alveolar and dental t, both of which can be aspirated.